Not Your Typical Three Little Pigs | What is ML Reading? My introduction to fairy tales told from a different viewpoint was in the early nineties. 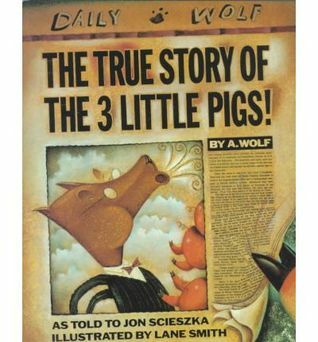 In my opinion, The True Story of The 3 Little Pigs By A. Wolf as told to Jon Scieszka and illustrated by Lane Smith is one of the best books from the 20th century. 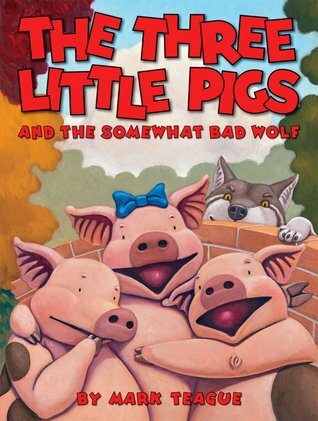 The Three Little Pigs and the Somewhat Bad Wolf by Mark Teague follows the traditional tale somewhat. However, there is perfectly legitimate reason the Wolf is running around town huffing and puffing houses down. He’s hungry. The donut shop is closed. . . the hot dog stand is locked. . . and the pizza parlor will not let him in. 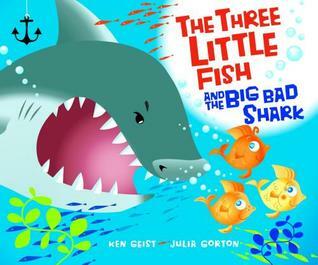 In The Three Little Fish and the Big Bad Shark by Ken Geist and Julia Gorton, it’s all about the fish and their finny fin fin. The shark doesn’t huff and puff. He munches and crunches. What’s your favorite fairy tale with a twist? This entry was posted in Picture Book and tagged Fairytales, Jon Scieszka, Julia Gorton, Ken Geist, Lane Smith, Margaret McNamara, Mark Fearing, Mark Teague, The Three Little Aliens and the Big Bad Robot, The Three Little Fish and the Big Bad Shark, The Three Little Pigs, The Three Little Pigs and the Somewhat Bad Wolf, The True Story of the Three Little Pigs by mlreads. Bookmark the permalink. Thanks for the mention of behalf of those little aliens! Pingback: 1st Grade Boy – Loves Superheroes… Doesn’t Like to Read (Part 1) | What is ML Reading?